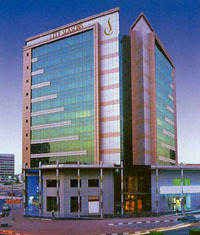 City Seasons Suites Dubai - Dubai Hotel Located in Dubai City Centre, Dubai Shopping Area and Dubai Business District! City Seasons, the boutique hotel located in the heart of Dubai, is elegantly designed to provide sophisticated services to business travellers and family guests. Less than 5 minutes drive from Dubai International Airport, offers quality and a great location opposite Deira City Centre Shopping Mall. City Seasons Suites is a fine blend of comfort and style. Original hand-painted artworks decorate the walls and marble floors add to the charm. Choose from a variety of spacious and luxuriously appointed suites for your stay in Dubai. Each suite offers modern conveniences and a high level of comfort for both short and long stays. After a day of business or sightseeing, City Season Suites fully equipped fitness centre is ideal for re-energising. Afterwards, relax in the Jacuzzi or enjoy a soothing massage. City Seasons is a perfect location for families looking for relaxing and an enjoyable stay. Hotel's in City Centre Dubai - Dubai Hotels Located in Dubai City Centre, Dubai Shopping Area and Dubai Business District!